The main tower block was built in 1966 and named after Belfast’s Divis Mountain. During the Troubles, the British Army built an observation post on top of the tower. The flats were the centre of much IRA through the Troubles. Rioters would entice soldiers to give chase into an arena from which their fighting could be viewed by hundreds of people on the balconies.Joyriders used the space in the same way, to perform before an audience. Ciaran Mackel remarks in his Troubles Archive Essay: Like the Rossville flats in Derry, the Sectra-system concrete Divis flats are of a slab and tower block construction, inherited by the NIHE rather than built by it, and they have attracted similar social problems since the late 1960s. Ultimately, after vigorous campaigning in the 1970s, large parts of the complex were demolished during the 1980s, though towers remain, forming distinctive elements on the city’s skyline. 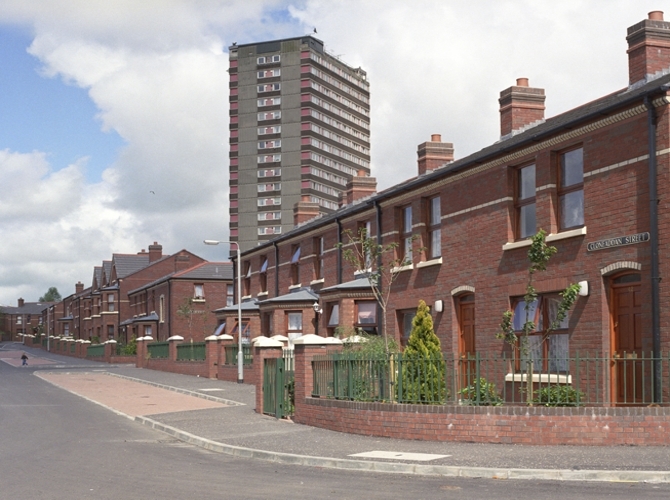 Elsewhere in Northern Ireland (for example at Cregagh and Belvoir estates in Belfast) high-rise solutions to social housing proved more successful for residents than they were at Divis. Brett argued that there was little option but to build in the manner chosen - and in particular upwards - at the time, as people wished to be re-housed (replacing slum housing) within the tight confines of St Peter’s parish (Housing A Divided Community, p.93). That said, the monolithic eight-storey deck-access structures were clearly problematic on a number of fronts and unacceptable for many residents. Dating from the 1960s, the large-scale Divis complex of flats in West Belfast proved controversial as housing; it has also been the visual backdrop to and part of the actual context of aspects of the Troubles conflict. It was erected as part of the flurry of expanded - some would say rushed - development of the early 1960s, following the realisation that British housing was in crisis. The local MP, Gerry Fitt, said at the time that his constituents looks forward to ‘the adventure of high rise living’. In fact, the flats would come to symbolise the disaffection of the working class people of Belfast and would be a very unpopular place to live. The Divis Flats are close to the Westlink ring road, on Divis Street, which is the start of the long arterial route that takes in The Falls Road and Andersonstown. Sectra-system concrete-based block of flats. A large complex of interlinked eight-storey deck-access flats and high-rise towers, following models from elsewhere in Britain and Europe.